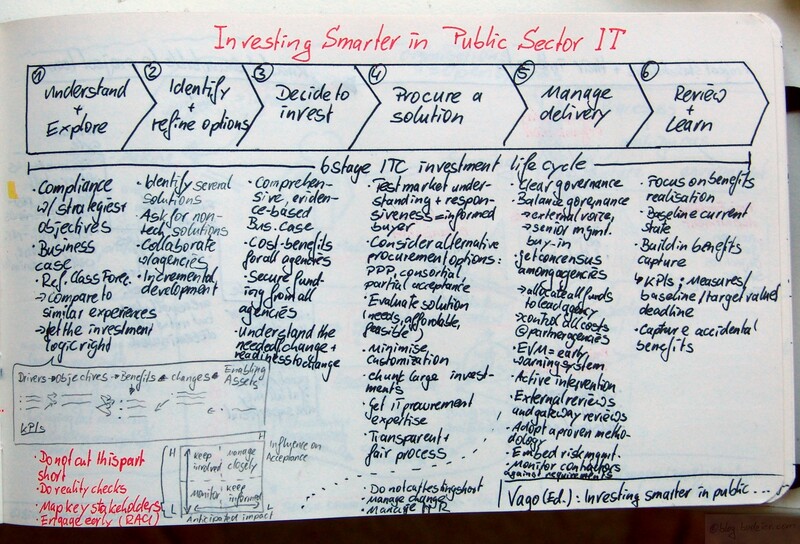 Victorian Auditor-General’s Office (VAGO): Investing Smarter in Public Sector ICT, Melbourne 2008. The nice thing in this guide is that it lists a lot of best practices, things to avoid, and gives meaningful examples. Although most of the recommendations sound fairly basic (It’s basic not trivial!) the hard part is actually doing them. I would never ever have expected that benefits and costs are not calculated cross agencies, or that someone is not considering a non-tech solution. Huff, Richard A.; Prybutok, Victor R.: Information Systems Project Management Decision Making – The Influence of Experience and Risk Propensity; in: Journal of Project Management, Vol. 39 (2008), No. 2, pp. 34-47. Huff & Prybutok analyse the antecedents of decision making of project managers in IT projects. Their hypothesis includes that knowledge and risk behaviour have an impact on decision-making. In both cases that can be empirically proven. Although knowledge is mostly driven by project management experience, whereas work experience has no influence on making decisions. The risk behaviour can be explained by the risk propensity, which are the „perceived psychological/emotional costs of the decision“. In short this means continuation decisions (which were the subject of this research) are influenced by the managers project management experience and by his/her risk propensity. Besner, Claude; Hobbs, Brian: Project Management Practice, Generic or Contextual – Reality Check; in: Project Management Journal, Vol. 39 (2008), No. 1, pp. 16-33. Among these factors the last one is the most interesting. Besner & Hobbs grouped their sample into three legs according to product type a) engineering & construction, b) IT, and c) business services. So where do IT projects fall short compared to their counterparts in Engineering and Construction? One area is the vendor management (bidding documents, conferences, evaluations) which is a strong point in E&C but a weak one in IT. Another area is the cost planning (financial measurements, cost data bases, top-down/bottom-up estimation, software for estimating costs) and in execution IT projects show lesser usage of Earned Value Techniques and Value Analysis. [Fair enough – I do think – the intangibility of IT projects makes it difficult to apply these concepts unbiased and meaningfully]. Wang, Eric T.G. ; Wei, Hsiao-Lan; Jiang, James J. ; Klein, Gary: User diversity impact on project performance in an environment with organizational technology learning and management review processes; in: International Journal of Project Management, Vol. 24 (2006), pp. 405-411.
a mediator. The authors find that success depends on management review and learning, but show user diversity to be fully mediated by organizational technology learning. Thus the authors conclude that user diversity should be considered an environmental factor to promote learning, but it may not be important in the completion of any particular project. Reich, Blaize Horner: Managing Knowledge and Learning in IT Projects – A Conceptual Framework and Guidelines for Practice; in: Project Management Journal, Vol. 38 (2007), No. 2, pp. 5-17. This paper won the PMI award for the best paper in 2007. She identifies 10 risks on the projects which arise due to knowledge gaps. Reich structures the risks from a systems and process perspective. Risks 1&2 are project inputs, Risks 3&4 are linked to the project governance, Risks 5-8 are operational risks, Risk 10 is an output risk. Since learning the way to bridge knowledge gaps, Reich concludes that the best way to address the risks is 4-fold (1) establish a learning climate, (2) establish and maintain knowledge levels, (3) create channels for knowledge flow, and (4) develop a team memory. Liebowitz, Jay; Megbolugbe, Isaac: A set of frameworks to aid the project manager in conceptualizing and implementing knowledge management initiatives; in: International Journal of Project Management, Vol. 21 (2003), No. 3, pp. 189-198. Liebowitz & Megbolugbe describe three frameworks which can be used by practitioners to think about Knowledge Management (KM) approaches. Firstly the outline Wiig’s framework which describes the knowledge activities cycle (Conceptualise –> Reflect –> Act –> Review –> Conceptualise…) and the connected workplace structure (Business processes, [used in] Knowlege items, [bound to] organisational roles). Secondly they present the Knowledge Management Pyramid and thirdly they derive a new implementation framework. Liebowitz & Megbolugbe’s framework connects the KM Intentions and Needs with the KM Solution via 4 knowledge objects/critical factors. (1) Knowledge taxonomies, (2) organizational culture, (3) user feedback on usability and functionalities, and (4) alignment with business strategy and senior management committment. Fortune, Joyce; White, Diana: Framing of project critical success factors by a systems model, in: International Journal of Project Management, Vol. 24 (2006), No. 1, pp. 53-65. How much overfitting does a model need? Fortune & White reviewed 63 studies on critical success factors of IT projects. And they identified 27 of them, the picture shows the success factors and in brackets how many publications were finding proof for it. The Top-5 are: (1) Senior management support, (2) Clear and realistic objectives, (3) Strong/detailed project plan kept updated, (4) Good communication/feedback, and (5) user/client involvement. Furthermore Fortune & White identify the 9 sub-systems typically found on an IT project and they sort the success factors accordingly. Nevertheless, DeMarco’s question (posted earlier in this blog) pops back into my mind: If only one thing succeeds – what should it be?